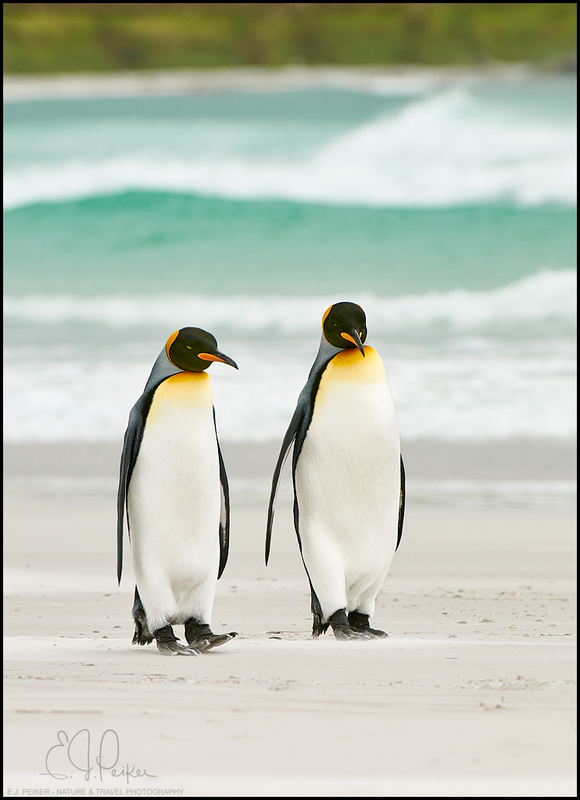 A complete reprocess of my award winning King Penguin shot "A Stroll on the Beach" which conjures up images of an old couple that's been together forever just strolling down the beach enjoying each other's company and the conversation. I am once again completely blown away by how much more detail, sharpness and just general image quality I can extract out of old files with modern tools like Capture One Pro 12, Topaz Studio and others. an image for the retired folks, great exposures on these penguin's and details as-well, fine stuff. Their heads are slightly turned toward each other (and the right one leaning), as if listening to each other. There are images that tell a story and ones that can conjure up a story. This is a great example of the later. Brilliant poses and image, EJ. Congratulations. Delightful! I can relate to those old "folks" strolling on the beach. Nice storyline and excellent image. Love the comp as is, but I did a browser scroll and removed the green at the top and liked that as well. I find the green at the top pulls the eye away from the fabulous subjects and that lovely water color. The exposure is perfect and the whites look great with lots of detail. What a magical capture! Superb, thought provoking image, and no wonder its an award winner. Gorgeous! Two friends having a casual chat on the beach all dressed up in black tie! Wonderful capture! What a nice shot E.J! Amazing looking birds. You captured the moment "A stroll on the beach" nicely.